You may prefer to see these pages as a photo slide show which contains the same text but presents the pictures full screen size. If so, click here. To see this information as a traditional web pages with further research and translation capabilities, click here. At the Southern tip of Dalmatia's Istria Peninsula, Pula rises from a bay that has sheltered navies from the galleys of Byzantium to the dreadnoughts of the Austro-Hungary Empire. Today it sports impressive Roman ruins including perhaps Europe's best-preserved forum and the 6th largest surviving amphitheater. In letters home, James Joyce called it a "naval Siberia" while writing Portrait of an Artist as a Young Man from its sidewalk cafes. Join us on our visit: While our prose is not up to Joyce's standards, our pictures are better. 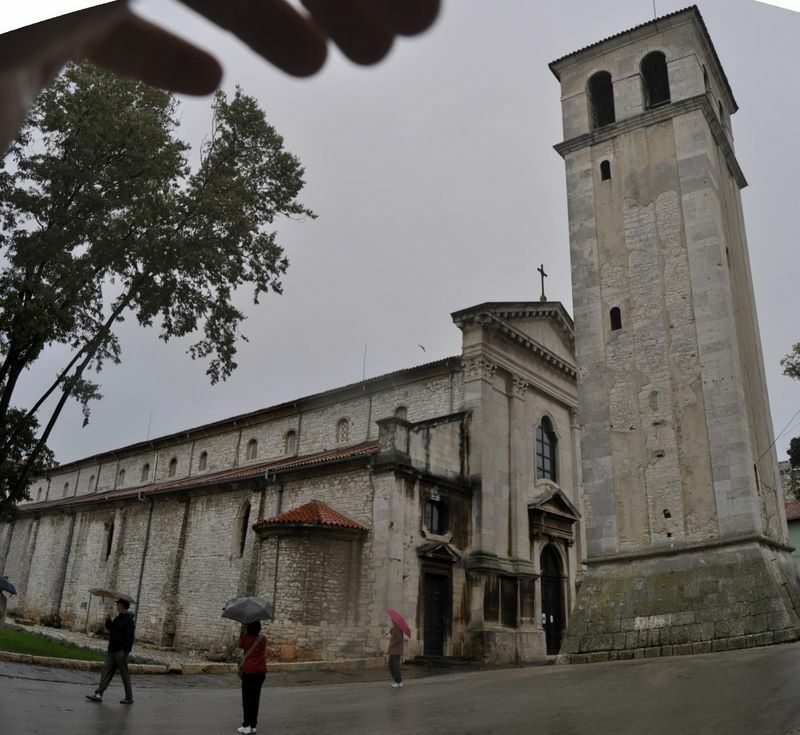 We visited Pula on a wet late October day when Dalmatia's Bora (north) winds sporadically dumped rain upon us -- in between bursts of sunlight so intense that we left our umbrellas behind. A big mistake! This picture (from Wikipedia) shows the magnificent natural shelter that explains why Pula became the main harbor for the Byzantium fleet in the 4th century. Starting in 1856, the Austro-Hungarian Empire would moor its battleships here, making this its main port. Today a navy is still present -- but Croatian. At left we see the Castle built on the ancient Roman Capitolium site on one of Pula's seven hills. 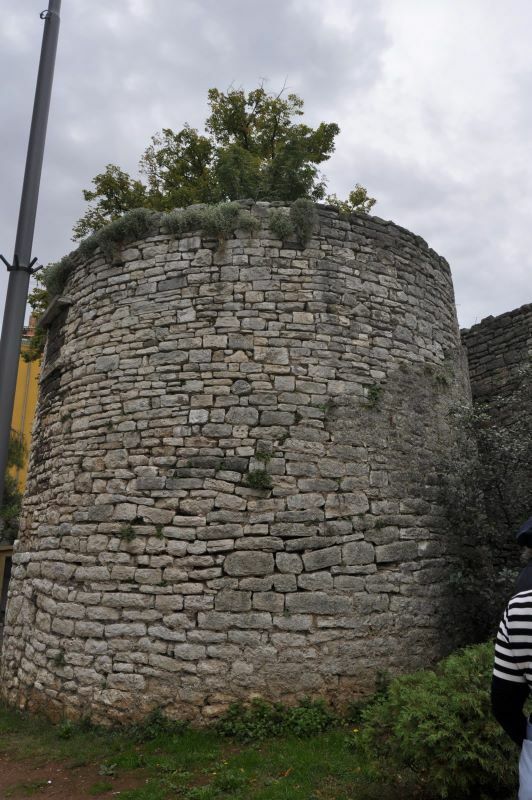 Around it, Roman engineers encircled Pula's walls in an oval shape. The oval to its right is the Coliseum. Pula is about as far north as Minneapolis or Bordeaux, France, but its climate is delightfully Mediterranean; so much so that both the Austrian-Hungarian emperors and Tito built their summer homes on nearby islands. Some consider this area the next Provence since its location and weather are similar (including an ugly winter mistral called "bora" here.) Lately, it's been getting attention for its cuisine including black and white truffles. Both Easyjet and Ryan Air have found the place as well. Once again, the barbarians invade. A million years before Tito, Homo erectus lived in caves found in Pula. Homo sapiens came here at least in Neolithic times, followed by several other cultures including the Greeks. These Greeks associate Pula's founding with the myth of Jason and the Argonauts. Sprinkled with Roman establishments, the image above depicts the shield-shaped peninsula of Istria which extends into the Adriatic. (Today Croatia shares it with Italy and Slovenia.) Pula is at the bottom and, like the rest of the Istrian peninsula, was part of Italy after WWI until Mussolini fell in 1943 and Nazi Germany took over. The Allies then repeatedly bombed Pula's strategic port on its deep-watered bay. Rome took control of the peninsula after conquering the native tribes in 177 BCE. 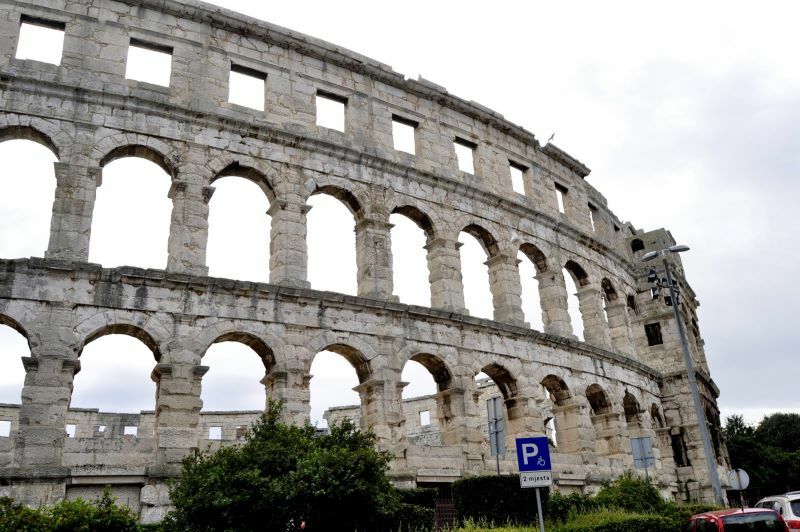 Pula peaked at about 30,000 people under Julius Caesar around 45 BCE. Pula bet on the wrong horse during the civil war that followed Caesar's assassination. 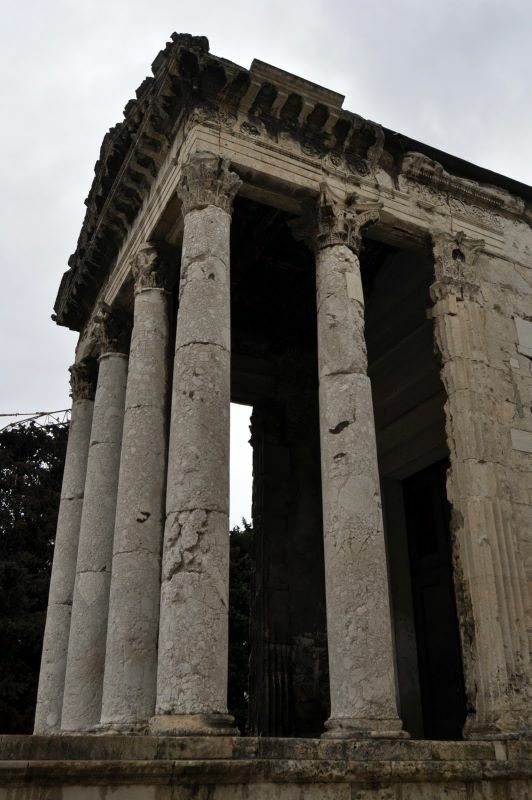 When Julius Caesar's great-nephew and adopted son/successor named Augustus eventually took power, he leveled Pula. (Shortly thereafter he started the Pax Romana which brought peace to the Mediterranean for 2 centuries.) Augustus's daughter convinced him to rebuild the city and it has featured some outstanding Roman architecture ever since. 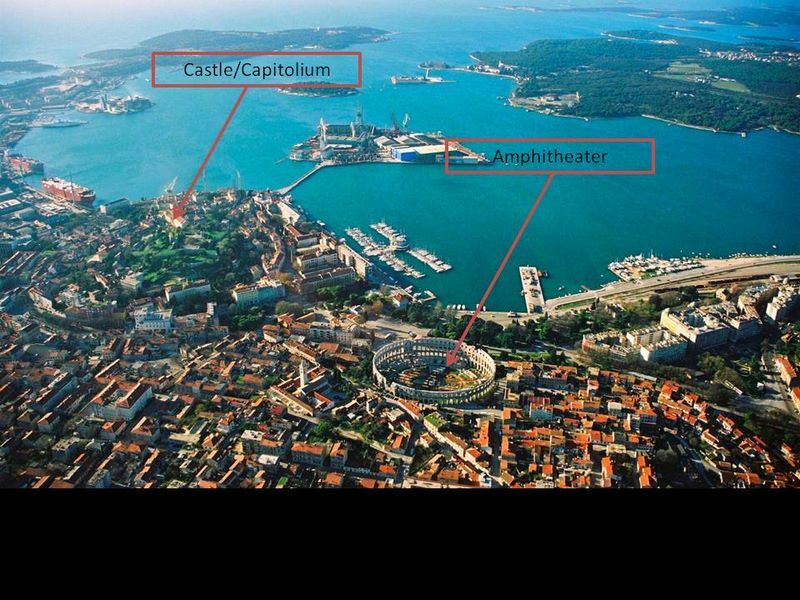 Most significant of what the Romans left is Pula's great amphitheater. While not much remains inside at ground level, the walls still form a near-perfect oval and within are held film festivals. After Rome fell, the Ostrogoths destroyed most of Pula but what they missed can be quite spectacular. 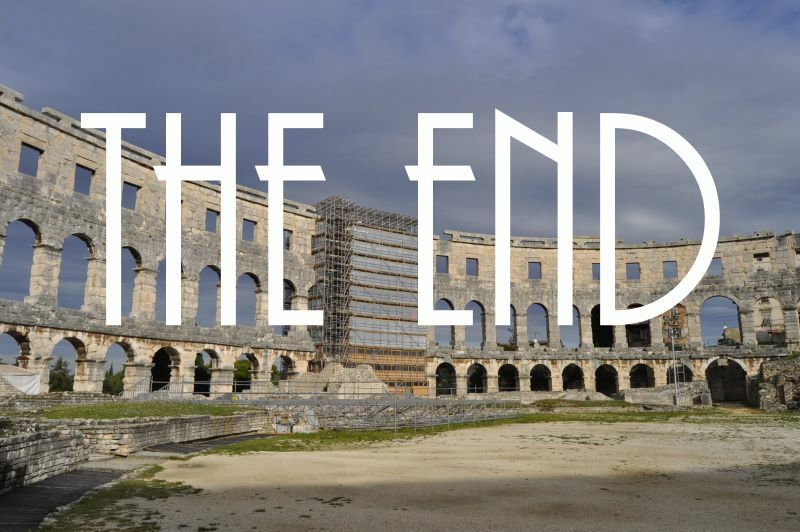 The Ostrogoths were followed by the Slavs who pretty much wiped out the rest of Dalmatia -- but not so much in Pula. Of the 200 extant Roman amphitheaters, Pula's is unique for having the stair towers intact. We see one of the four at far right in the picture above. These held wooden steps that helped the 23,000 spectators quickly exit from the arena. The limestone walls rise inside over 100 feet but are different heights on the outside as the land slopes vigorously here to the port. The sea side needs 3 stories, the other side only 2. The ellipse is 435 feet long and 345 wide. Inside, like a Greek theater, the ground sloped to hold seats, eliminating the need for much of the interior stone construction found elsewhere. A set of canvas "sails" formed a roof to keep out sun and rain and probably drained into two cisterns on each stair tower. This water (after being perfumed) could then be sprinkled upon heated spectators. This lion is in no danger of being fed to a Christian -- although it's likely this arena saw human vs. beast action in the late 3rd century. Emperor Diocletian conducted the largest (and only empire-wide) persecution of the Christians around then. 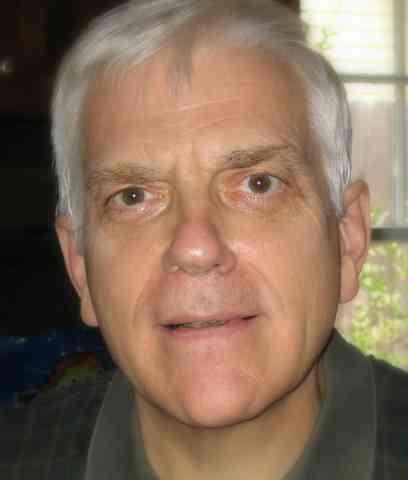 The Pope at the time was Caius. 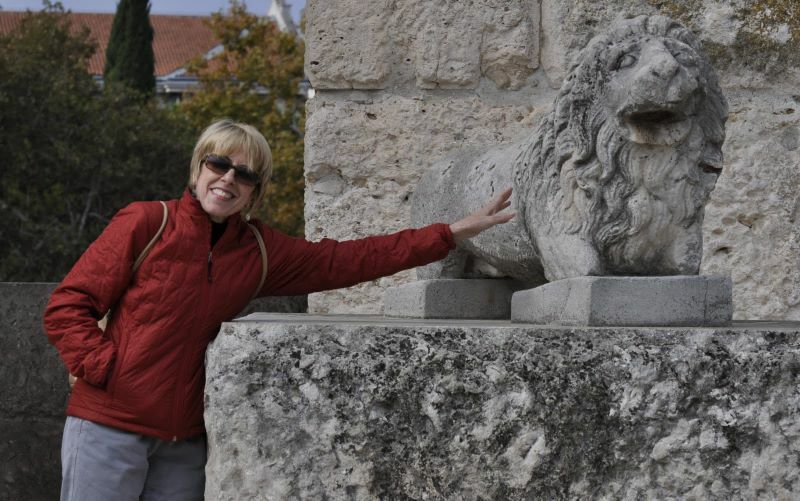 Both were from the same extended family in Split (Dalmatia)! A generation after those two, Christianity became the official religion of Rome. With the resulting dearth of victims, gladiators began killing animals and each other. Eventually prisoners sentenced to death fought each other. (In concussion, I might add that I write these words on a Super bowl Sunday from a country which would never conduct such spectacle. Today's Saints are no longer martyrs.) After Augustus leveled Pula, an early arena was constructed of wood in 14 ACE. This was replaced by a successively enlarged stone building completed in 81 ACE. Given the space required, it was built outside the walls on the road that led (where else) to Rome. But like a lot of us, the place barely survived the middle ages. Venice ran the town for 400 years and proposed moving the arena to Venice in 1583. (While the Renaissance awakened interest in Greece and Rome, could Venice -- where Titian had died seven years earlier -- have needed more art?) 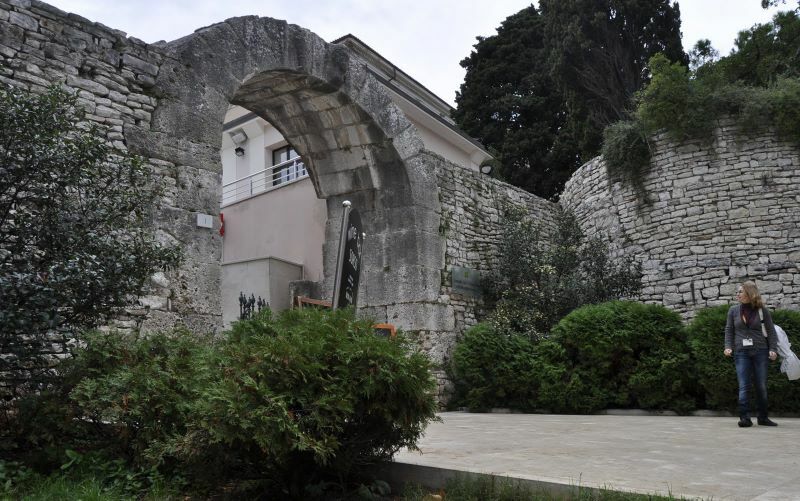 A Pula-born Venetian senator earned a plaque among these stones by quashing the plan. But many stones did move -- the last being in 1709 to help build a belfry foundation we will see in a few more slides. Fortunately, Marshall Marmont whom Napoleon had tasked with governing Dalmatia, started a restoration which continued under the Austrians. Today, Pula's arena holds 5000 spectators who might lionize the likes of Pavarotti, Carreras, or Elton John -- or watch a movie, which, of course, would be called a "film." 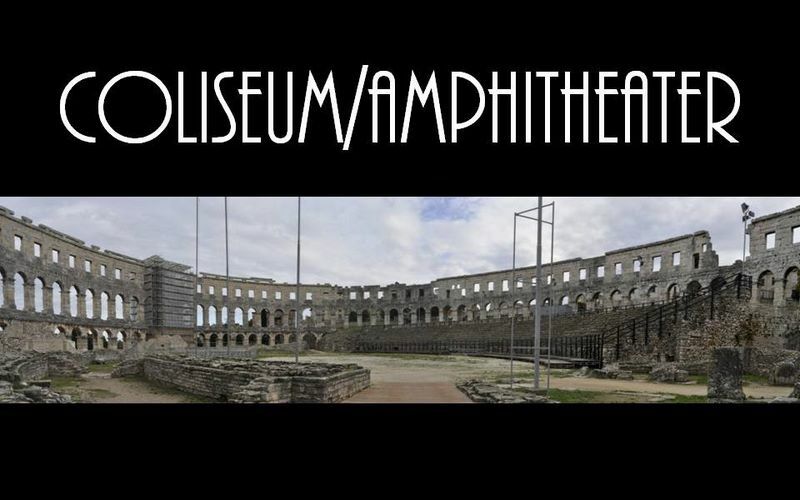 Most surviving amphitheaters hold museums inside. Pula's Area basement specializes in ancient trade with huge displays of the freight containers of Rome's day, the amphorae. The walls discuss Rome's roads and sea lanes that moved these amphora through the Pax Romana area. But the puzzler was this Roman view of cartography long before Western mapmakers pointed charts to the north and attempted to depict the shapes of landforms that astronauts would someday photograph from on high. 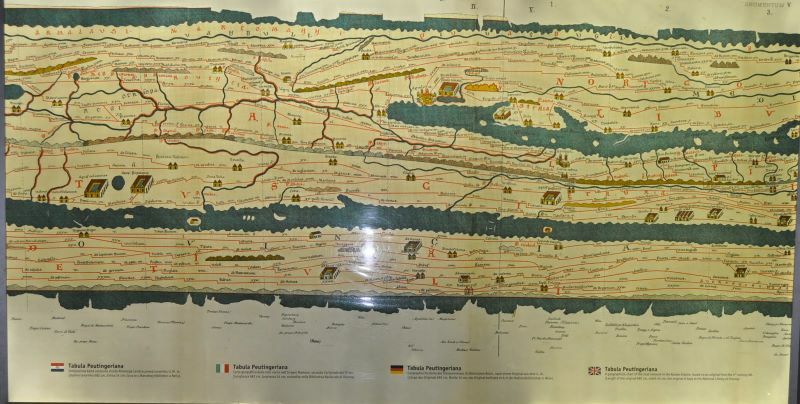 It's a copy of the 20-foot-wide Tabula Peutingeriana, the most famous itinerarium (Roman road map). Just about anything you see will be a copy based in part upon a 25-year effort by 3 Greek geographers that was carved in stone and placed near Rome's Pantheon around 44 BCE. This version is a copy of a 13th-century parchment reproduction made by a monk and hardly ever displayed by the Viennese museum that now protects it. In this map, Rome is literally the center of its 5th century world. (North is left). The "wall" at center is the Apennines range that rise like an angry cat's backbone over Italy. At top is the Dalmatian coast with the Istrian Peninsula (and Pula) just to the right of center. Anyone thinking of Saul Steinberg's "View of the World Cover" for a 1976 New Yorker? Or maybe an old AAA TripTik? 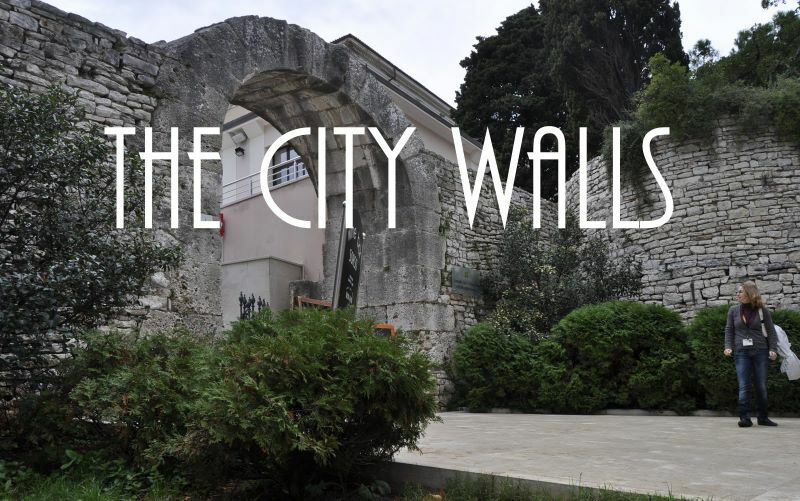 Let's leave the walls of the amphitheater and see a few more sites of this town. Given our short stay and frequent attacks from the rain, we were not able to see much more than the old Roman walls and forum. After Caesar Augustus leveled the town, the Romans built it back up as the location was too strategic to ignore. They added an aqueduct and reservoirs, built roads, and encircled the place with walls. Pieces of these remain as we see here at the Hercules Gate. The Romans buried their dead outside of their towns for sanitation reasons. 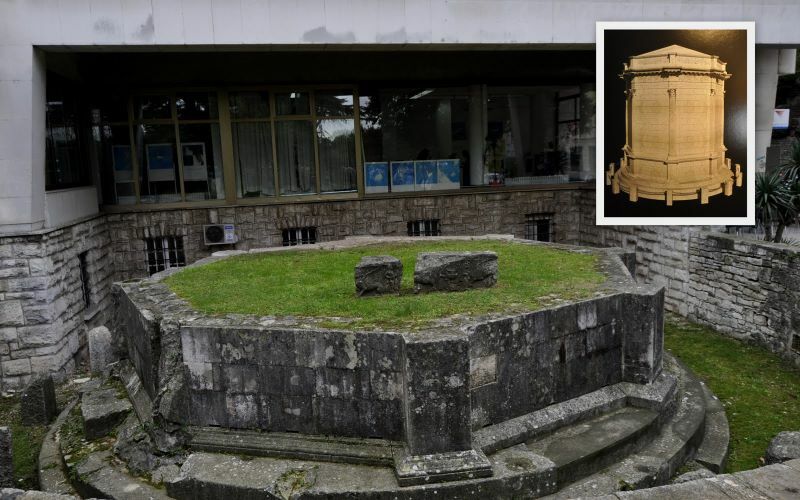 This often led to series of elaborate tombs lining the roads just before the city gates as noble families kept up with the Jones in death every bit as much as they did in life.Here we see the remnants of a first century octagonal mausoleum along with (insert) a computerized reconstruction. Note the reverence for the site by the architect who constructed the building behind it. Like most ancient habitation areas, graves are found here just about any time someone digs below the surface. An extension of the sewage system revealed many necropoli whose headstones were usually appropriated as building blocks for houses during the middle ages. Except for a small run between two gates, the town walls were removed in the early 19th century. A few of the original ten (some say twelve) gates remain. Above is the Gemini (twins) gate done in a late 1st or early 2nd century style. Michelangelo visited and sketched it and some of the other Roman remains as he studied classical models.Pula had two Roman theaters and this gate may have served as the decorative entrance to one of them. 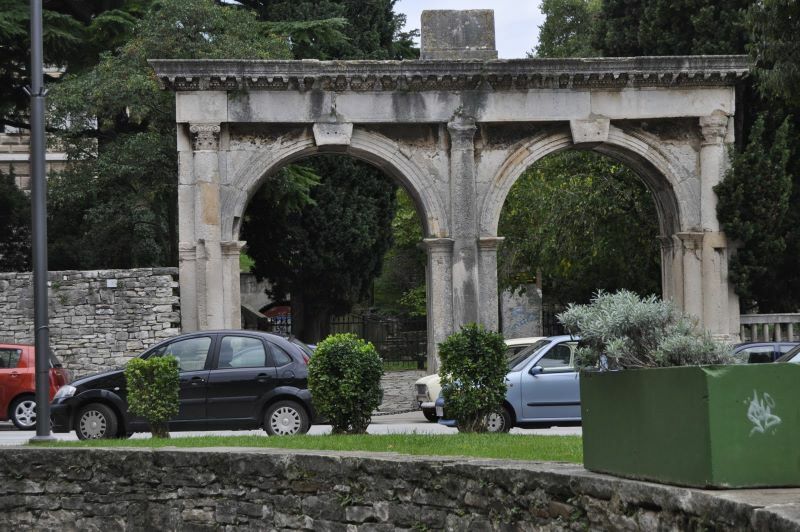 Before Marshall Marmont and the French mandated the restoration of Pula (and much of the rest of the Roman buildings in Dalmatia), this is how the twin gates looked. The remnants of the 2000-year-old wall link the Gemini gate with this Gate of Hercules, the oldest surviving Roman structure. Hercules was the town's patron; his badly eroded bust projects from the keystone of the entrance arch, barely visible at the top of this picture. Some also see Hercules symbol, clubs (the kind you hit people with, not the ones on playing cards) at the statue's left; but this takes a bit of touro-imagination. 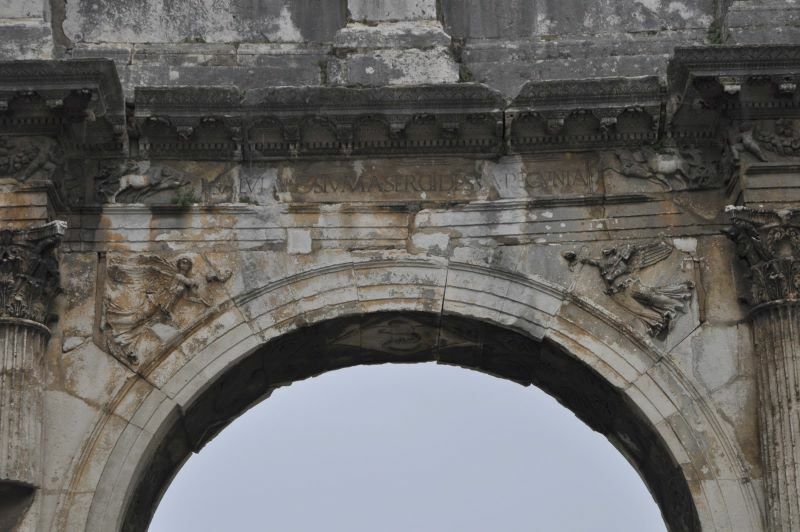 The Hercules gate was protected by these typically circular Roman towers which appear here to be mortarless.The arch also contains a damaged inscription describing the founding of the city by a brother of Cassius who was one of the plotters against Julius Caesar. 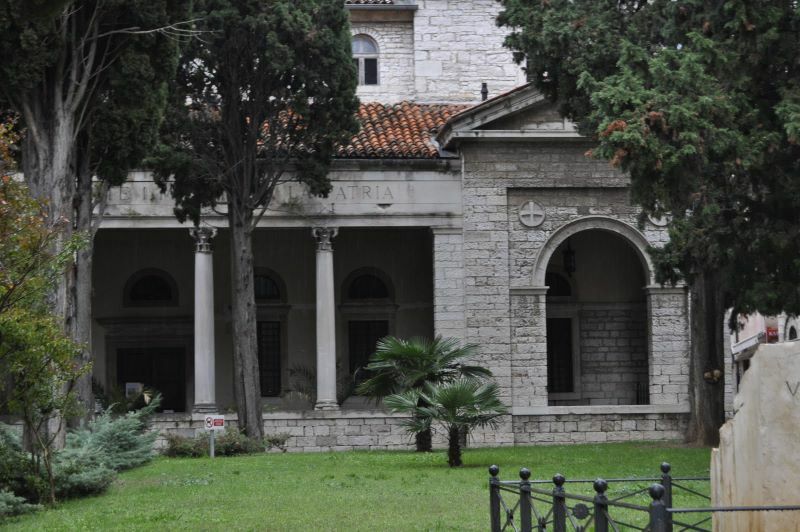 Based upon that text, historians date the founding of Pula between 47 and 44 BC. The Romans were on Dalmatia's Istrian peninsula over a century before that. This was probably when the place became Roman. Other humans had been here at least as early as the 10th century BCE. The Greeks trace the founding of Pula much earlier as part of the story of Jason and the Argonauts. 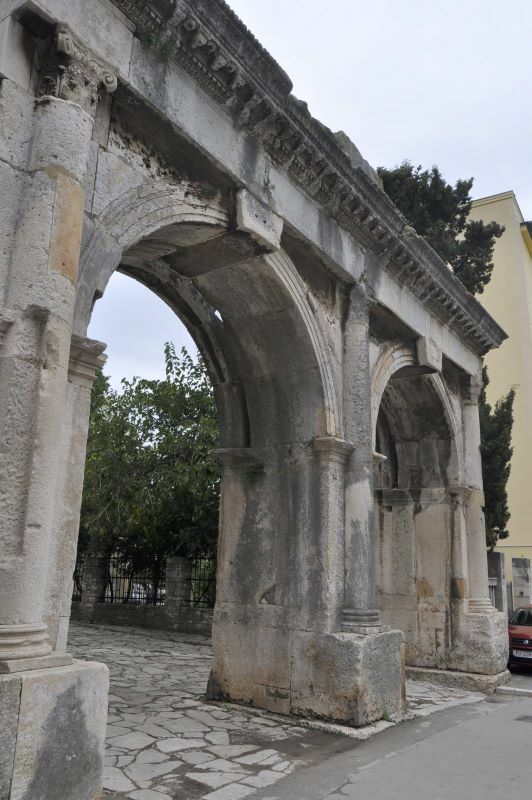 This arch was built shortly after, around 28 BCE, to honor three brothers of a long running Pula dynasty called the Sergii. Their statues once stood on top. One of the brothers was a tribune at Actium. It was built just inside the Roman naval gate. 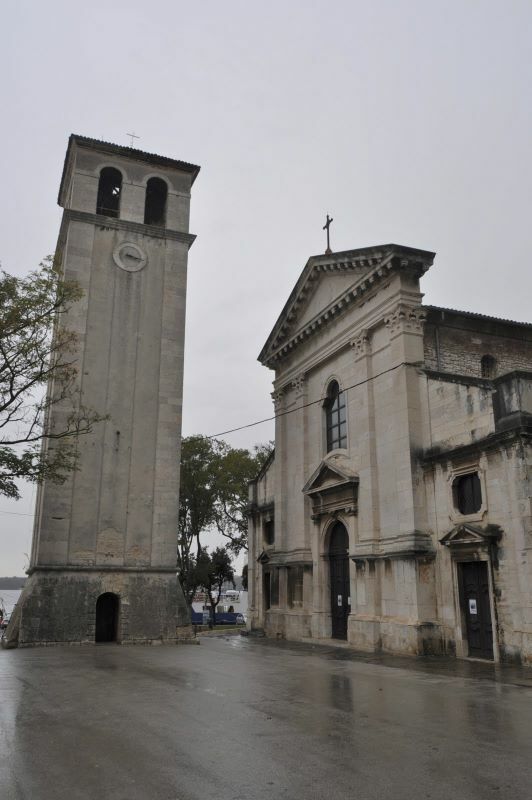 The Sergii stayed in power in Pula at least into the 13th century as Genoa tried to seize control of their city which was then allied with Pisa. The neo-classical Austrian architect Pietro Nobile redesigned the area around this arch in 1824 with the intent of making the arch stand alone. 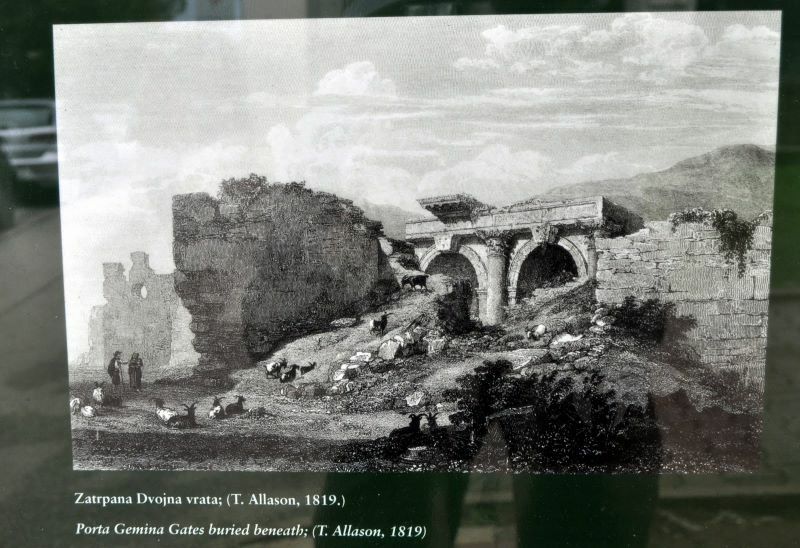 In so doing, the naval gate in front of it was removed -- leaving the Sergii Arch at the center of a new square which expanded to the old town walls by the end of the 19th century.Here we see the arch deteriorating with the arch stone at right moving away from the time-damaged Corinthian pillars at left. Above we see some of the carved reliefs on the Sergii family arch. This monument was, in fact, an integral part of the town gate structure and led to the town Forum. Pula's great harbor made it a natural place from which to try to dominate the Adriatic. The Sergii family led that effort during the Middle Ages. 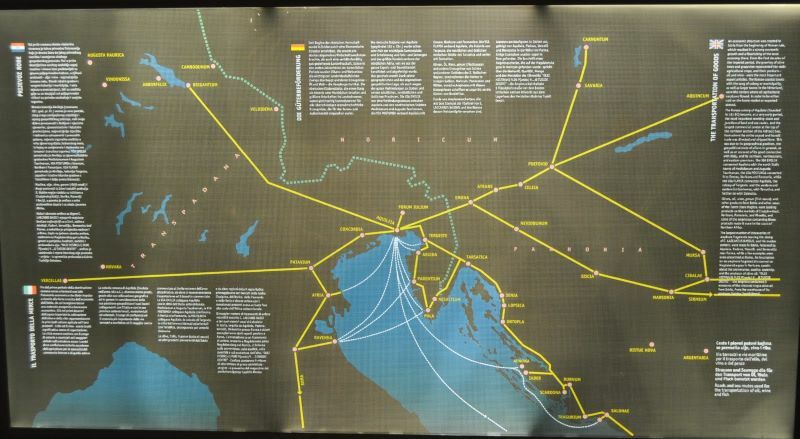 This, of course, put them and Pula in confrontation with that great city to the north: Venice. The Venetians did their best to bring the town under their hegemony, starting in 1145. With many revolts from the locals, it took until the 14th century before Venice established control once and for all -- until Napoleon wiped out Venetian rule in 1797. 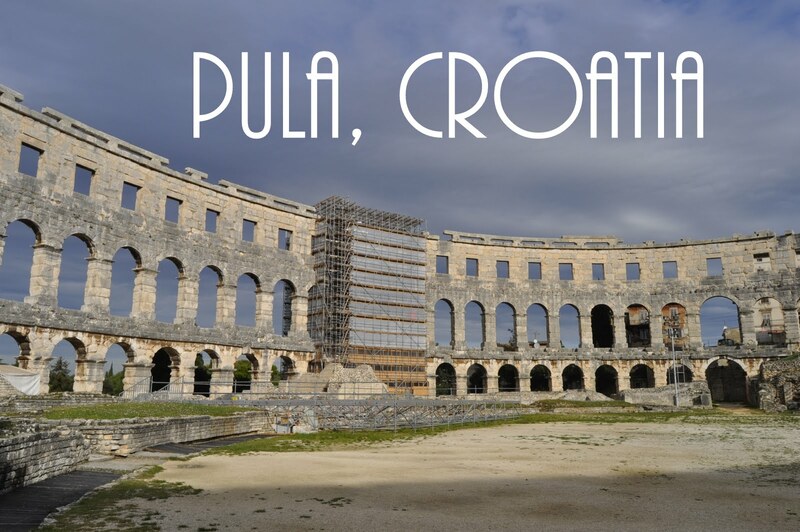 During the centuries of Venetian control, Pula declined. Venice hurt but the plague devastated. 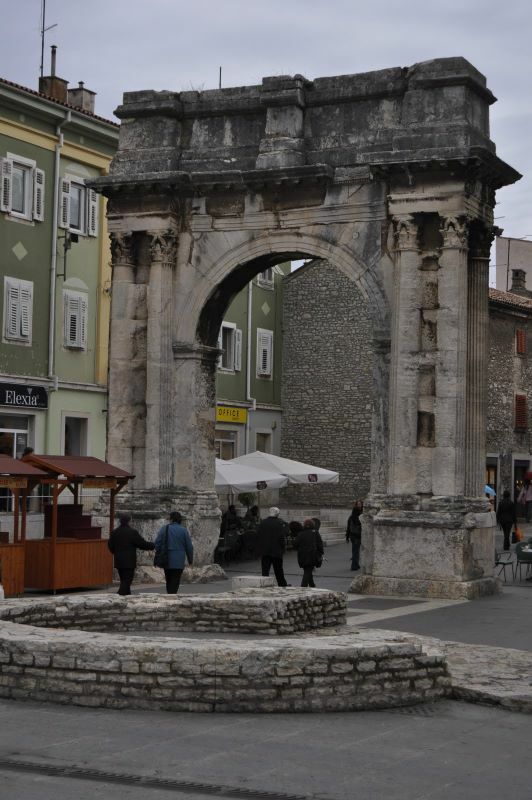 The Arch of the Sergii exemplifies late Hellenistic-Roman architecture. Why then do its spandrels sport apparently Christian angels? In fact, they represent a goddess called "Winged Victory." (Been to Paris? One of its greatest (but headless) Greek statues stands as one the three ladies of Paris's Louvre. Guys don't always notice that it's headless.) Goddess Victory is an appropriate memorial of the great battle of Actium, and of one of its local warriors (even though the town itself bet on the wrong side and was later leveled by the winner. )The Greek name for this goddess was "Nike" and yes, the arch-golfer Tiger Wood's many swoosh logos trace their lineage directly from her. The Romans named her "Victoria." Tiger has not been behaving in a Victorian manner lately; perhaps his role model was not the goddess Nike but rather the U.S. Army's early missile system named after her. Not all of us have evolved that far from the club-carrying homo erectus whose remains were found in a quarry 3 miles from here. 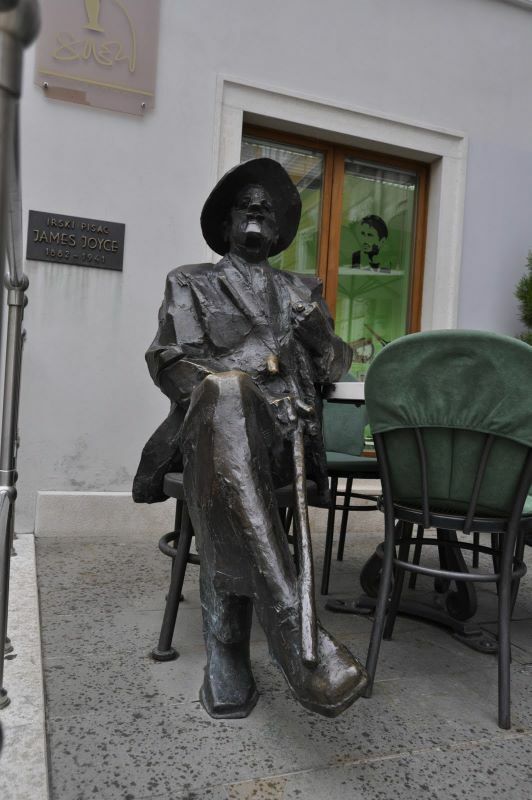 But some of us have: Near the arch sits this 2003 statue of James Joyce by Croatian sculptor Mate ÄŒvrljak. 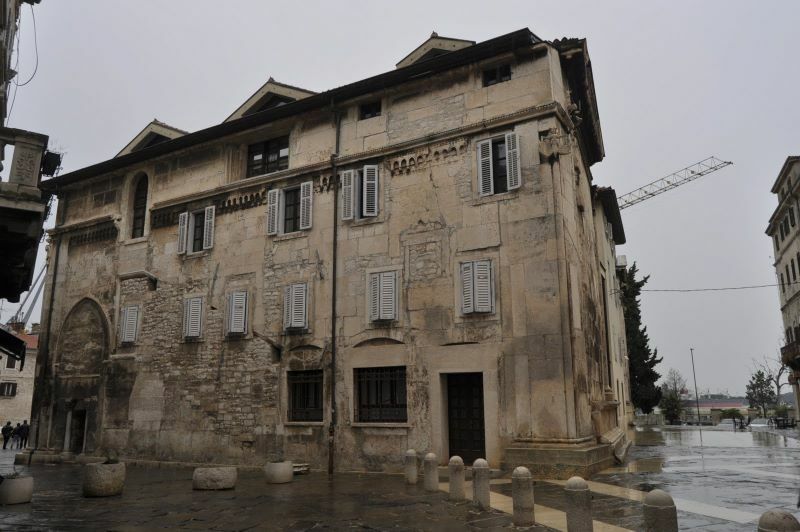 In his early twenties, the wily writer lived here briefly in 1904/5 at the home port of the Austro-Hungarian battleships awaiting that war to end all wars. He made his living at the local Berlitz School, teaching English to naval officers for about $3.25 per week. Too highbrow? Try this: Georg Ludwig von Trapp was stationed here before his "Sound of Music" days. His father and other Trapps are buried here (but the hills are still alive). His sister was a painter and lived here as well. 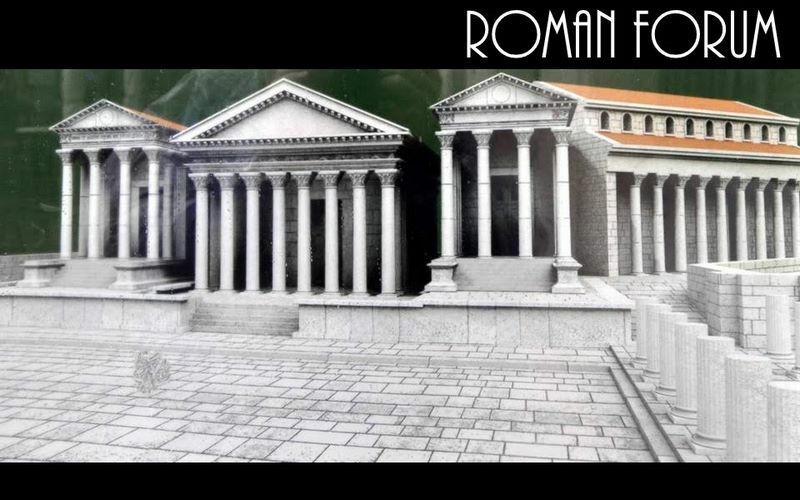 While in most towns the old Roman Forum can only be conceptualized, enough remains in Pula to see traces in the wide plaza that abuts the port. Excellent multilingual signs such as the one above also help. Here we see three 1st century ACE temples with the basilica extending to the right. 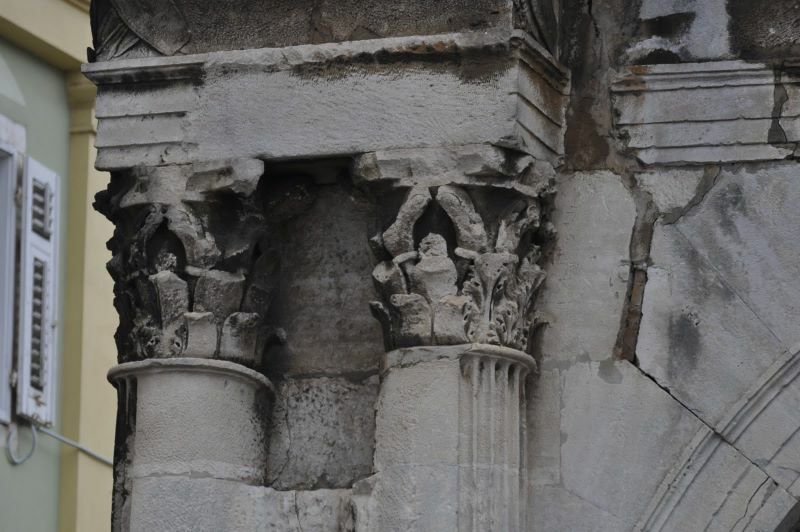 These temples honor (left to right) Augustus (who tore the town down and built it back up), Hercules (patron of Pula), and Diana (not sure why). Note the Roman basilica stretching at an angle from her temple. Here we see these temples. 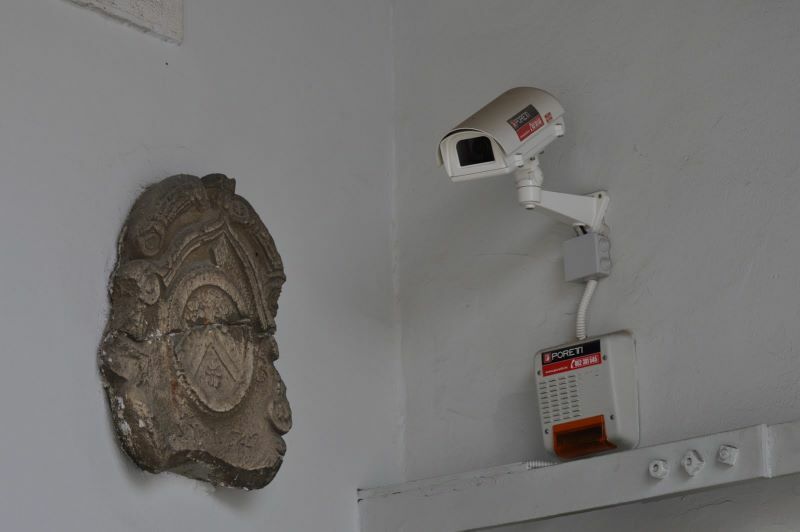 Augustus's at left is recognizable but the two at right have been incorporated into the town hall. (The two temples are more obvious from their backside as we'll see in a minute.) 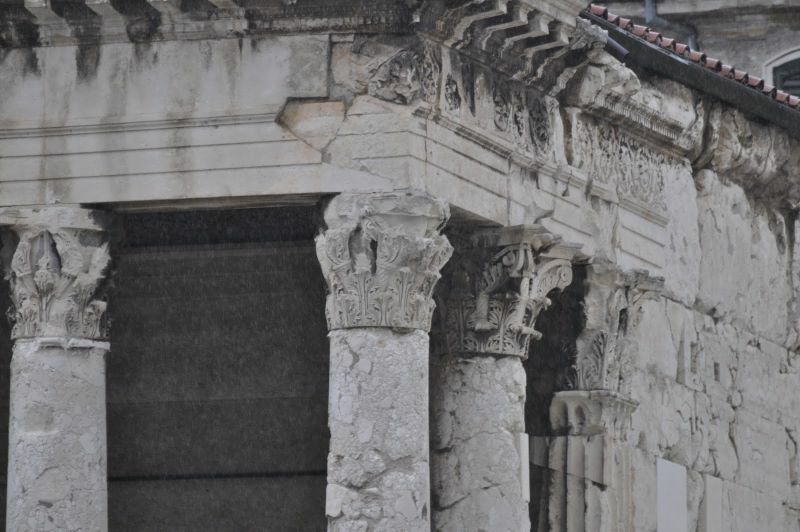 Despite such remodeling, this is still the best preserved forum in Croatia and one of the best in all of Europe. In Roman times, the masses stayed in the lower end while this literally upper end held the temples and the patricians. Inside the gallery of the town hall incorporated into the two right temples, hang exterior decorative details -- old and new. Joyce failed to mention Pula in his literature (but derided it in his letters home as a "Naval Siberia"). But George Orwell's Big Brother would like this place. 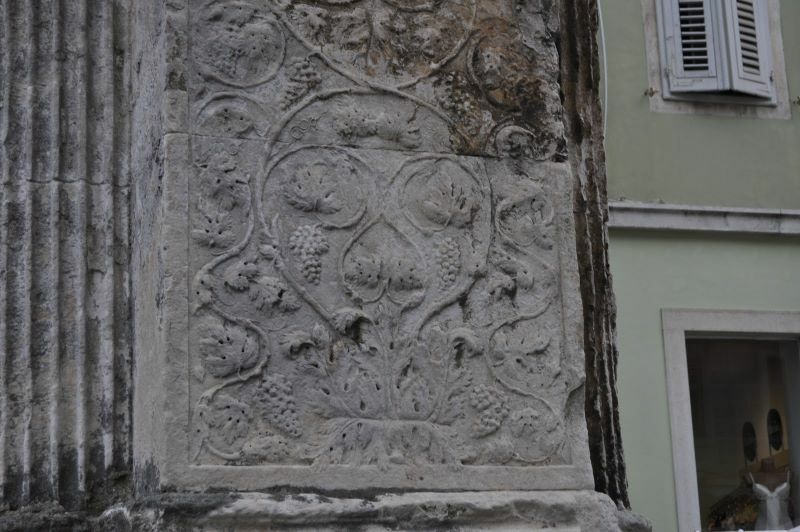 ...although it could use a bit of restoration as its Corinthian columns have many chipped Acanthus leaves. The back side of the town hall shows how Hercule's Capitolium and the Temple of Diana were merged into the town hall during the middle ages. 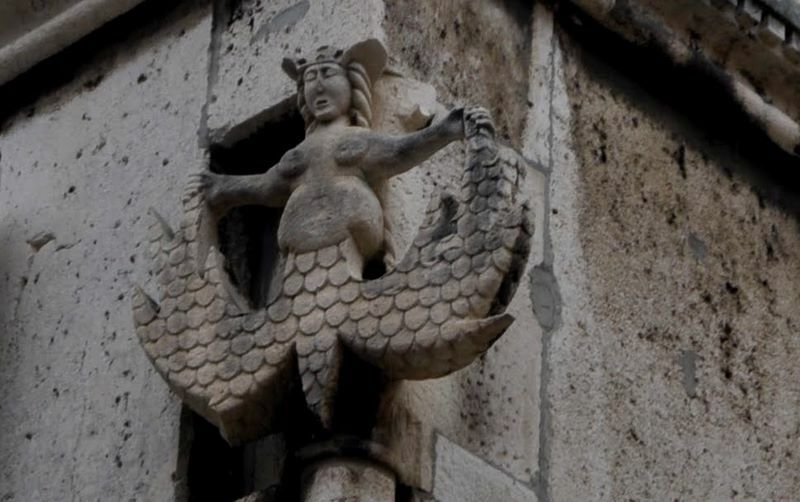 ...this strange mermaid on the old temple of Diana, obviously pregnant yet carved to scale. Just northwest of the forum is the cathedral with its bell tower, built between 1671 and 1707 with stones appropriated from the amphitheater. The cathedral's Renaissance facade is from the 16th century, meant to repair earlier damage from Genoese and Venetian raids. 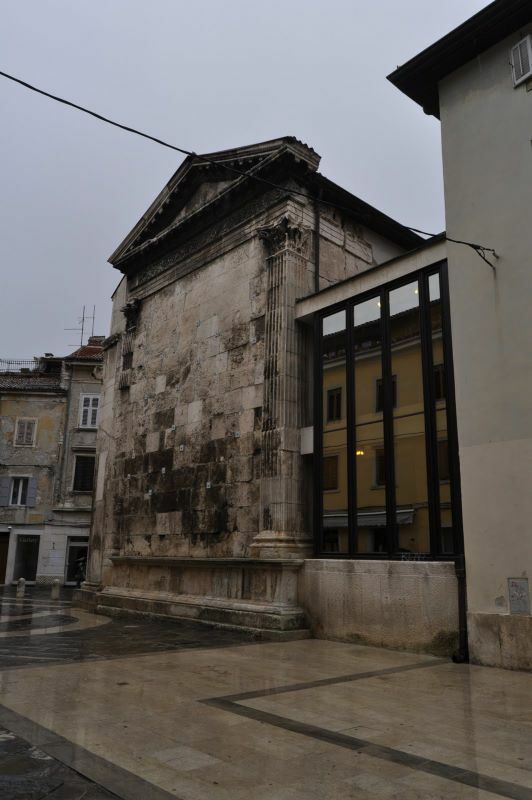 By then, Pula was safely within Venice's control. Like many Mediterranea cathedrals, this is dedicated to the Assumption. Its predecessors started here, built into the defensive walls of the town as early as the 4th century. Stone transformations have been taking place ever since, with completion in 1924. We couldn't go inside but did get this view of the courtyard. These columns look suspiciously like those that once graced one of Pula's beautiful Roman theaters. Perhaps robbing Augustus to pay Paul? Early in church history, this peninsula had many bishoprics relative to its geographic size (8 in all). 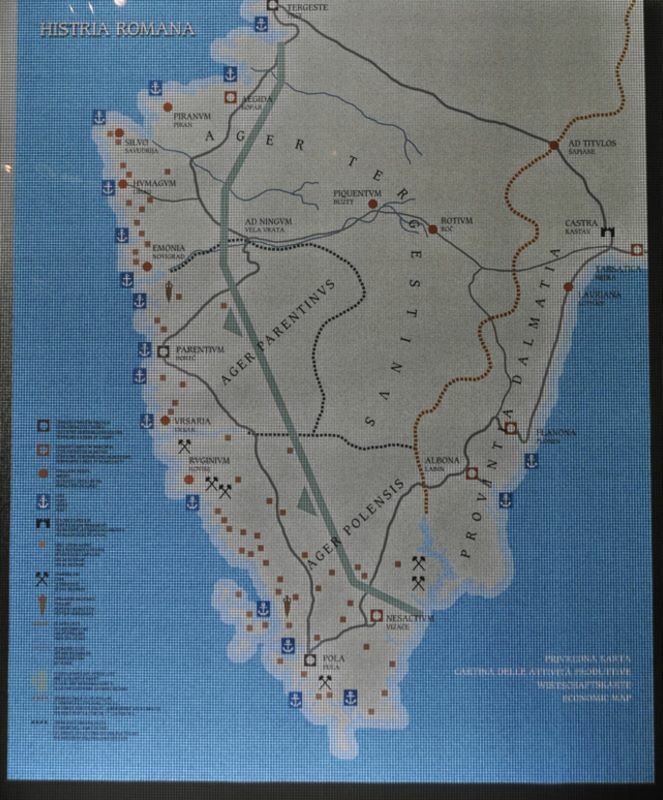 Historians view this as evidence that Istria's population was fairly large and fairly Catholic. 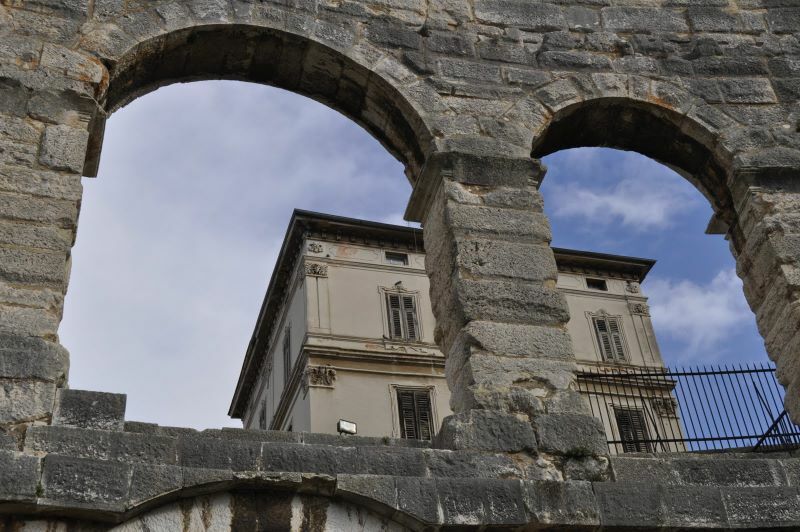 Again we end with a tourotip: Despite the effort Pula takes to care for its ancient ruins, it keeps state-of-the-art in some aspects of daily life. 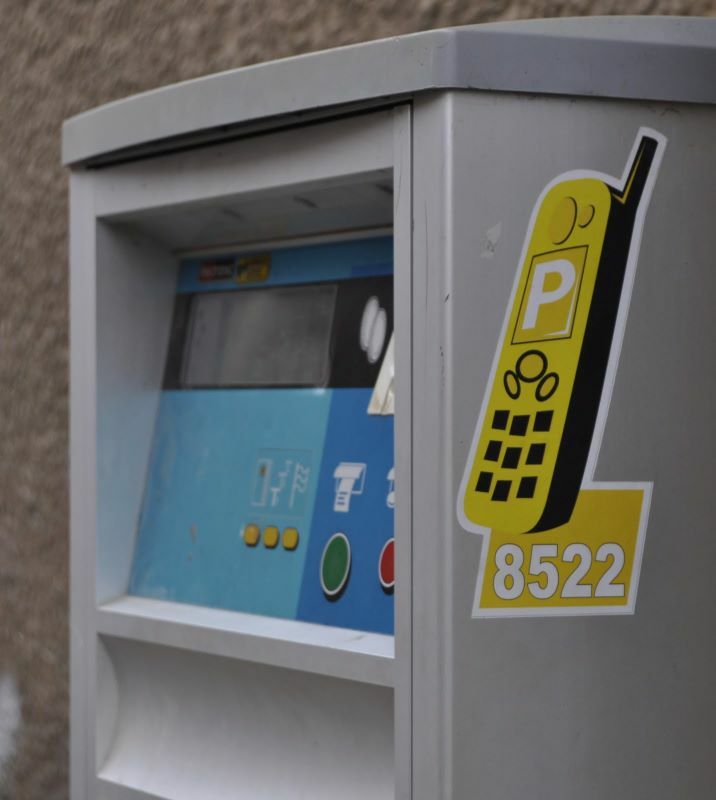 Here's an example: You pay for parking by calling with your cell phone. I'd assume that you already have a few things set up already such as your billing information. If not, you stuff coins into this kiosk. Here the parking attendant checks the license against his wireless database. How civilized! Even better than the variable pricing for rest rooms (based on gender) that we saw in Split. Thanks for visiting. Please visit all of our travel pages by clicking here. Please join us in the following slide show to give Pula the viewing it deserves by clicking here.